Frederick is also the originator of his own faith... 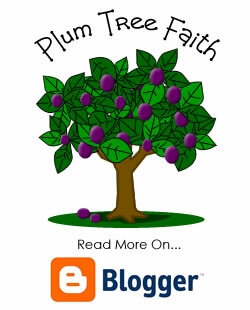 Plum Tree Faith! His Sublime Juiciness the Venerable Archpip Plumtree, Founder and spiritual Pip of the Plum Tree Faith, welcomes you to this webpage. Rejoice all Plums, Repent ye Prunes. If you are willing to think new thoughts, and old ones can be pretty dismal, then hopefully you will be interested and amused by views that might help you live a happier life with a more genial God. That God is Alive -There is little point in prayer if he is not. That God lives within us - Where else? That God made man and made woman in 'His' image - God gave us a body, brain and soul, the flesh, the pip, and the kernel - three essential parts to both us and the Plum. All thinking people should be intensely suspicious of religions formed ages ago when despots and their cronies held absolute power. Devious nasty people may have used religions to play a confidence trick on us, taking the name of God for evil ends. We should fear that this deception will overpower our minds, causing us to wrinkle up, wither, and become a prune. Verily you should keep your flesh fresh, your pip up, and your kernel pure, for this is the path to juiciness you must follow, thereby avoiding the life destroying process of 'Premature Prunification', so evident in many of our society. It is written in the sap of the sacred plum tree, that God wants us all to enjoy this beautiful planet He created for our earthly pleasure. We must take care of this heritage. Let the sweet juices of the plum flavour your life and you will blossom and bear fruit. This is a God for the young at heart, and a Faith that wants you to enjoy your life on Earth. Blossoms be upon you and may sweet juices nourish your life from henceforth. With celestial felicitations, I am your most affectionate Archpip Plumtree.